Virtual Try-n-Buy is an application that will revolutionize buying experience for your customers. Enhance your customer’s in-store experience with offering your patrons unlimited collections with a managed inventory. We effectively use platforms that are android and iOS based to create a virtual store of products. 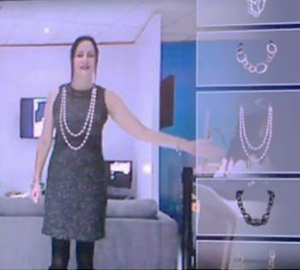 Gesture based, Kinect driven Try & Buy where the BUYER would come to the showroom and stand in front of the Magic mirror. The mirror would turn on and the Kinect would map the buyer. The mirror would display the picture of the buyer along with a menu with categories. Using gesture, the buyer could select the category and the Jewellery and see it on herself. She could also save the image, share it on social media. Online – Let them try it on Anywhere!!! 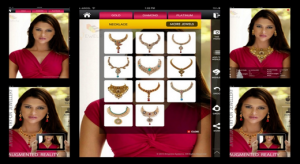 Offer the convenience of browsing at home or work and trying jewels virtually to select the right look. Engage new and current customers in an interactive way from the convenience of their mobile devices or online websites. Customers can effortlessly browse your current inventory any time, any place, anywhere. Changes made are instantly available to customers. Customers can store their favorite items in a cart to try on again later or buy the next time they’re in the store. This feature simulates customer behavior of trying out various jewels in front of a mirror to help them overcome their anxiety of how the apparel featured online would actually look on them.